A Miami developer this week bought six acres on the New River in Fort Lauderdale and plans to build a $135 million project with a residential component. Cymbal Development paid $11.5 million for the property that once housed the landmark Shirttail Charlie’s restaurant. The project will include retail, residential and a marina, according to the developer’s website. “Based on the buyer’s past development history and their plans for a mixed-use development here, we believe everything we had hoped for on that property will come to fruition,” said Cara Kronengold, a lawyer for the seller, an affiliate of Aventura-based Cabi Developers. Cabi New River acquired the land over the past several years and wanted to build a high-end marina and boat storage facility, Kronengold said. But those plans were scrapped when the economy soured, and Cabi New River filed for Chapter 11 bankruptcy a year ago. A marina with 200 storage spaces is on the 5.8-acre site now, along with a water taxi service. 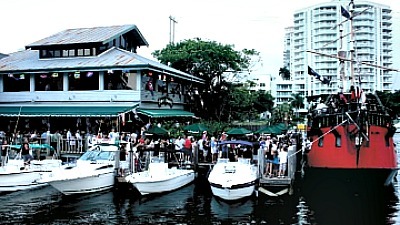 Shirttail Charlie’s closed in 2007 and currently operates as Pirate Republic Seafood Grill & Bar, pictured above. Cymbal Development, headed by Asi Cymbal, assumed the leases as part of the purchase, and it’s unclear when construction will begin, Kronengold said. Cymbal officials could not be reached for comment Friday, despite attempts by phone.